Hi again! It's Angie from The First Grade Scoop here. I know many of you have been on break for some time now, but we're inching toward the finish line... Just four more days with students left! Phew! Time is flying, especially when thinking about all that needs done. Something I've been trying to do to get ahead of the game is prepping copies of stuff I use all the time in my classroom. 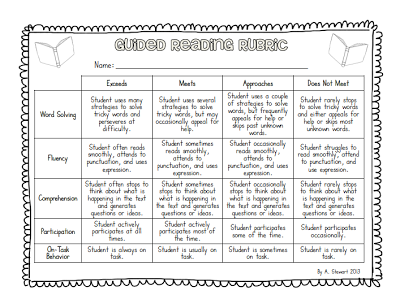 Two things I'm making tons of copies of now are my guided reading and Daily 5 rubrics. Staying on top of grading is my #1 goal for next year. Something that made it easier for me this year was having assigned assessment days for each of my students. I number my students alphabetically by last name. I divided my class equally by numbers across the days of the week. I have 29 students, so Monday is the assessment day for students #1-6, Tuesday is the day for students #7-12, and so on. Of course, sometimes students are absent on their assessment day, but it's easy to make it up the next day, and that means that all students are assessed with the same frequency. I hope this tip helps as you plan for next year (or just try to get through the last few days of this one!). I also want to be on top of grading/assessments too. These are great tools!! Question for you...how often would you use these? We use Treasures so I was thinking of using them during the assessment week of the series. Thanks for sharing! 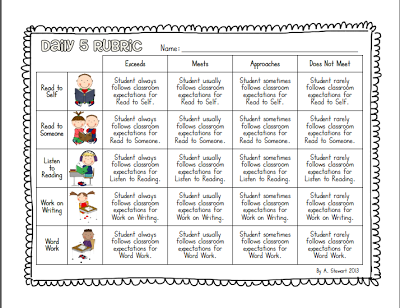 Thanks for the rubrics! I'm a fellow TBR contributor and I just went and checked out your blog. Very cute!